Today I got to experience my first float in a sensory deprivation tank. I set it up following my mom’s funeral and my Zero Launch Party because I really needed to relax, but a maiden voyage of this sort is somewhat anxiety-provoking, or at least it was for me. Signing the waivers and watching the introductory video I was full of fears – fear that my mild claustrophobia would set in, fear that I would have a panic attack, fear that my bad knees would make it hard to get in and out of the tank, fear that something would suddenly seep or ooze out of me requiring a $500 cleaning fee. My mind went all sorts of places, but recognizing that I was in full control of the situation, I felt the fear and did it anyhow. 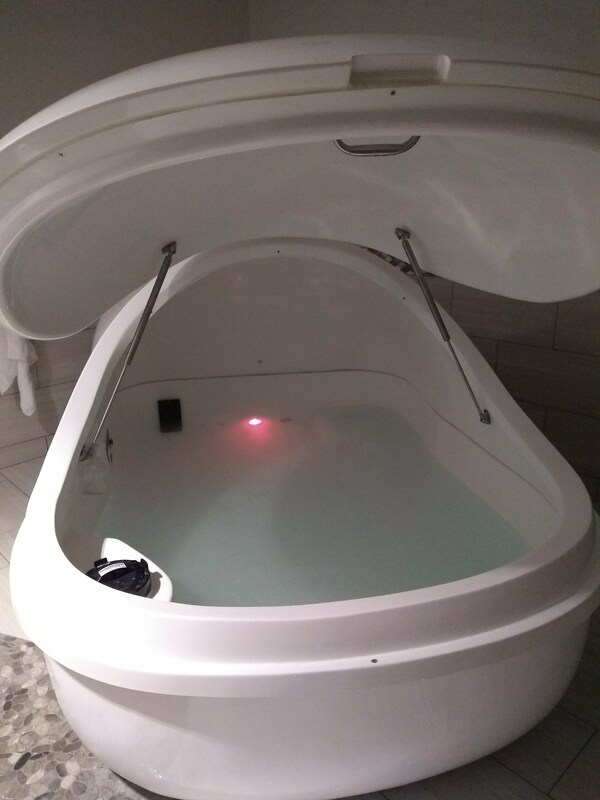 For the first 15 minutes or so, I floated with the door of the tank open, but those bits of me that were floating just about the warm sodium-infused water were cold, and it was distracting, so I recognized that I would need to close the door if I was going to enjoy the experience…*gulp*. Sure enough, closing the tank helped regulate the temperature and so I started to feel like I was getting closer to the goal. There was a red light inside the tank that made me feel safe and so I enjoyed another 20 minutes with my eyes closed against a soft red glow. Eventually I got acclimated to the situation and even started to grow bored, so I dared to turn off the light and float in the darkness – and I’m so glad I did! This is where the true sensory deprivation happened – it was so dark that it didn’t matter if my eyes were open or closed. All bodily sensations had disappeared and soon I was reduced to nothing but thought and breath. Then in those moments where I could eliminate thought – I was just breath. And in that last 15 minutes in the tank – floating in darkness and existing only as breath, I was able to grasp the concept of pneuma – i.e. “breath” and “soul” as the same thing. Next time I do a float, I’m going to be closing the tank and killing the lights in my first five minutes. *lol* I may also plan ahead for some creative work. parapsychological experimentation, or just some plain ol’ journeying. ← So what exactly is this Zero Launch Party launching?